It is a nice argument. One may criticize he gets the right thing out because he puts the right things in – such as the values of e and m, for example 🙂 − but it’s nice nevertheless! Having complimented Feynman, the calculation above does raise an obvious question: why is it that we cannot confine the electron in “too small a space” but that we can do so for the nucleus (which is just one proton in the example of the hydrogen atom here). Feynman gives the answer above: because the mass of the electron is so much smaller than the mass of the proton. Huh? What’s the mass got to do with it? The uncertainty is the same for protons and electrons, isn’t it? It is an interesting point, so let me expand the argument somewhat. We actually use a more general mathematical property of the standard deviation here: the standard deviation of a variable scales directly with the scale of the variable. Hence, we can write: σ(k·x) = k·σ(x), with k > 0. So the uncertainty is, indeed, smaller for larger masses. Larger masses are associated with smaller uncertainties in their position x. To be precise, the uncertainty is inversely proportional to the mass and, hence, the mass number effectively acts like a reverse scale factor for the uncertainty. In statistics (and in probability theory), they call this a chi distribution with three degrees of freedom and a scale parameter which is equal to a = (kT/m)1/2. The formula for the scale parameter shows how the mass of a particle indeed acts as a reverse scale parameter. 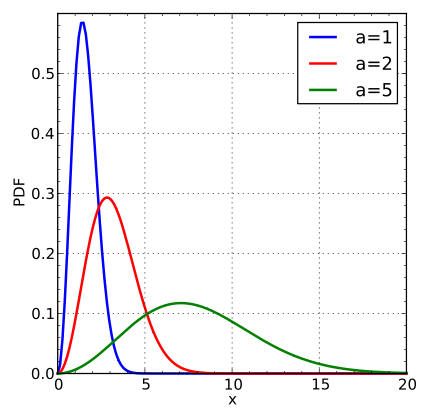 The graph above shows three graphs for a = 1, 2 and 5 respectively. Note the square root though: quadrupling the mass (keeping kT the same) amounts to going from a = 2 to a = 1, so that’s halving a. Indeed, [kT/(4m)]1/2 = (1/2)(kT/m)1/2. So we can’t just do what we want with Δv (like multiplying it with 1836, as suggested). In fact, the graph and the formulas show that Feynman’s assumption that we can equate p with Δp (i.e. his assumption that “the momenta must be of the order p = ħ/Δx, with Δx the spread in position”), more or less at least, is quite reasonable. Of course, you are very smart and so you’ll have yet another objection: why can’t we associate a much higher momentum with the proton, as that would allow us to associate higher velocities with the proton? Good question. My answer to that is the following (and it might be original, as I didn’t find this anywhere else). When everything is said and done, we’re talking two particles in some box here: an electron and a proton. Hence, we should assume that the average kinetic energy of our electron and our proton is the same (if not, they would be exchanging kinetic energy until it’s more or less equal), so we write <melectron·v2electron/2> = <mproton·v2proton/2>. We can re-write this as mp/me = 1/1836 = <v2e>/<v2p> and, therefore, <v2e> = 1836·<v2p>. Now, <v2> ≠ <v>2 and, hence, <v> ≠ √<v2>. So the equality does not imply that the expected velocity of the electron is √1836 ≈ 43 times the expected velocity of the proton. Indeed, because of the particularities of the distribution, there is a difference between (a) the most probable speed, which is equal to √2·a ≈ 1.414·a, (b) the root mean square speed, which is equal to √<v2> = √3·a ≈ 1.732·a, and, finally, (c) the mean or expected speed, which is equal to <v> = 2·(2/π)1/2·a ≈ 1.596·a. You’ll raise a third objection now: the radius of a proton is measured using the femtometer scale, so that’s expressed in 10−15 m, which is not 60 but a million times smaller than the nanometer (i.e. 10−9 m) scale used to express the Bohr radius as calculated by Feynman above. You’re right, but the 10−15 m number is the charge radius, not the uncertainty in position. Indeed, the so-called classical electron radius is also measured in femtometer and, hence, the Bohr radius is also like a million times that number. OK. That should settle the matter. I need to move on. Before I do move on, let me relate the observation (i.e. the fact that the uncertainty in regard to position decreases as the mass of a particle increases) to another phenomenon. As you know, the interference of light beams is easy to observe. Hence, the interference of photons is easy to observe: Young’s experiment involved a slit of 0.85 mm (so almost 1 mm) only. In contrast, the 2012 double-slit experiment with electrons involved slits that were 62 nanometer wide, i.e. 62 billionths of a meter! That’s because the associated frequencies are so much higher and, hence, the wave zone is much smaller. So much, in fact, that Feynman could not imagine technology would ever be sufficiently advanced so as to actually carry out the double slit experiment with electrons. It’s an aspect of the same: the uncertainty in position is much smaller for electrons than it is for photons. Who knows: perhaps one day, we’ll be able to do the experiment with protons. 🙂 For further detail, I’ll refer you one of my posts on this. What’s Explained, and What’s Left Unexplained? There is another obvious question: if the electron is still some point charge, and going around as it does, why doesn’t it radiate energy? Indeed, the Rutherford-Bohr model had to be discarded because this ‘planetary’ model involved circular (or elliptical) motion and, therefore, some acceleration. According to classical theory, the electron should thus emit electromagnetic radiation, as a result of which it would radiate its kinetic energy away and, therefore, spiral in toward the nucleus. The quantum-mechanical model doesn’t explain this either, does it? I can’t answer this question as yet, as I still need to go through all Feynman’s Lectures on quantum mechanics. You’re right. There’s something odd about the quantum-mechanical idea: it still involves a electron moving in some kind of orbital − although I hasten to add that the wavefunction is a complex-valued function, not some real function − but it does not involve any loss of kinetic energy due to circular motion apparently! There are other unexplained questions as well. For example, the idea of an electrical point charge still needs to be re-conciliated with the mathematical inconsistencies it implies, as Feynman points out himself in yet another of his Lectures. Having mentioned a few things that remain unexplained, the model does have the advantage of solving plenty of other questions. It explains, for example, why the electron and the proton are actually right on top of each other, as they should be according to classical electrostatic theory, and why they are not at the same time: the electron is still a sort of ‘cloud’ indeed, with the proton at its center. My little exposé on mass being nothing but a scale factor in the Uncertainty Principle is a good occasion to reflect on the Uncertainty Principle once more. Indeed, what’s the uncertainty about, if it’s not about the mass? It’s about the position in space and velocity, i.e. it’s movement and time. Velocity or speed (i.e. the magnitude of the velocity vector) is, in turn, defined as the distance traveled divided by the time of travel, so the uncertainty is about time as well, as evidenced from the ΔEΔt = h expression of the Uncertainty Principle. But how does it work exactly? Hmm… Not sure. Let me try to remember the context. We know that the de Broglie relation, λ = h/p, which associates a wavelength (λ) with the momentum (p) of a particle, is somewhat misleading, because we’re actually associating a (possibly infinite) bunch of component waves with a particle. So we’re talking some range of wavelengths (Δλ) and, hence, assuming all these component waves travel at the same speed, we’re also talking a frequency range (Δf). The bottom line is that we’ve got a wave packet and we need to distinguish the velocity of its phase (vp) versus the group velocity (vg), which corresponds to the classical velocity of our particle. I think I explained that pretty well in one of my previous posts on the Uncertainty Principle, so I’d suggest you have a look there. The mentioned post explains how the Uncertainty Principle relates position (x) and momentum (p) as a Fourier pair, and it also explains that general mathematical property of Fourier pairs: the more ‘concentrated’ one distribution is, the more ‘spread out’ its Fourier transform will be. In other words, it is not possible to arbitrarily ‘concentrate’ both distributions, i.e. both the distribution of x (which I denoted as Ψ(x) as well as its Fourier transform, i.e. the distribution of p (which I denoted by Φ(p)). So, if we’d ‘squeeze’ Ψ(x), then its Fourier transform Φ(p) will ‘stretch out’. That was clear enough—I hope! But how do we go from ΔxΔp = h to ΔEΔt = h? Why are energy and time another Fourier pair? To answer that question, we need to clearly define what energy and what time we are talking about. The argument revolves around the second de Broglie relation: E = h·f. How do we go from the momentum p to the energy E? And how do we go from the wavelength λ to the frequency f? The answer to the first question is the energy-mass equivalence: E = mc2, always. This formula is relativistic, as m is the relativistic mass, so it includes the rest mass m0 as well as the equivalent mass of its kinetic energy m0v2/2 + … [Note, indeed, that the kinetic energy – defined as the excess energy over its rest energy – is a rapidly converging series of terms, so only the m0v2/2 term is mentioned.] Likewise, momentum is defined as p = mv, always, with m the relativistic mass, i.e. m = (1−v2/c2)−1/2·m0 = γ·m0, with γ the Lorentz factor. The E = mc2 and p = mv relations combined give us the E/c = m·c = p·c/v or E·v/c = p·c relationship, which we can also write as E/p = c2/v. However, we’ll need to write E as a function of p for the purpose of a derivation. You can verify that E2 − p2c2 = m02c4) and, hence, that E = (p2c2 + m02c4)1/2. Now, to go from a wavelength to a frequency, we need the wave velocity, and we’re obviously talking the phase velocity here, so we write: vp = λ·f. That’s where the de Broglie hypothesis comes in: de Broglie just assumed the Planck-Einstein relation E = h·ν, in which ν is the frequency of a massless photon, would also be valid for massive particles, so he wrote: E = h·f. It’s just a hypothesis, of course, but it makes everything come out alright. More in particular, the phase velocity vp = λ·f can now be re-written, using both de Broglie relations (i.e. h/p = λ and E/h = f) as vp = (E/h)·(p/h) = E/p = c2/v. Now, because v is always smaller than c for massive particles (and usually very much smaller), we’re talking a superluminal phase velocity here! However, because it doesn’t carry any signal, it’s not inconsistent with relativity theory. Now what about the group velocity? To calculate the group velocity, we need the frequencies and wavelengths of the component waves. The dispersion relation assumes the frequency of each component wave can be expressed as a function of its wavelength, so f = f(λ). Now, it takes a bit of wave mechanics (which I won’t elaborate on here) to show that the group velocity is the derivative of f with respect to λ, so we write vg = ∂f/∂λ. Using the two de Broglie relations, we get: vg = ∂f/∂λ = ∂(E/h)/∂(p/h) = ∂E/∂p = ∂[p2c2 + m02c4)1/2]/∂p. Now, when you write it all out, you should find that vg = ∂f/∂λ = pc2/E = c2/vp = v, so that’s the classical velocity of our particle once again. This entry was posted in Physics and tagged alpha, Bohr radius, fine-structure constant, mass as a scaling factor, Planck units, stability of atoms, Uncertainty Principle. Bookmark the permalink. I think there is a little mistake in the third paragraph before the end: lambda=h/p and not lambda=p/h. Thank you for this very useful explaination. Thanks so much. I corrected it. I used the right formula in the rest of the text so it should not affect the argument. Thanks for the thanks also. 🙂 It’s nice to know my posts make someone happy from time to time – or at least encourage people to think about it all. Does the Uncertainty Principle apply to atoms, ions, or even molecules or only to subatomic particles? I ask because in early discussions (c.1930) authorities such as J von Neumann considered the quantum behaviour of ions in biologic systems.